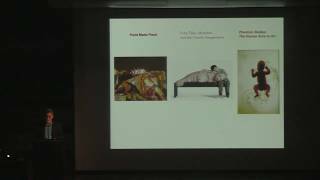 In this lecture, chief curator Mark Scala discusses how artists in Chaos and Awe respond to cultural shifts that are so sweeping and unpredictable that they lead to feelings ranging from helplessness, anxiety, and even terror to excitement at the possibilities of boundless knowledge and new levels of connectivity. Artists in this international survey blend abstraction and realism to dramatically describe emotional states that arise in response to unrestrained globalism, conflicts arising from cultural displacement and political extremism, and the radical expansion, intrusion, and promise of technology. These feelings are traditionally associated with the sublime, a word used to describe the sensations one might experience while contemplating the vastness and dangerous indifference of storms at sea, towering mountain ranges, or the infinite reach of the night sky. For many people today, this notion of the sublime corresponds to the contemplation of the ungraspable dimensions of the human-made universe.